I snapped this photo above out my window on the way down highway 130 yesterday. It shows a large portion of Kalapana Gardens subdivision with the steam ocean entry just beyond the Hakuma fault forest. Click on it for a larger size. 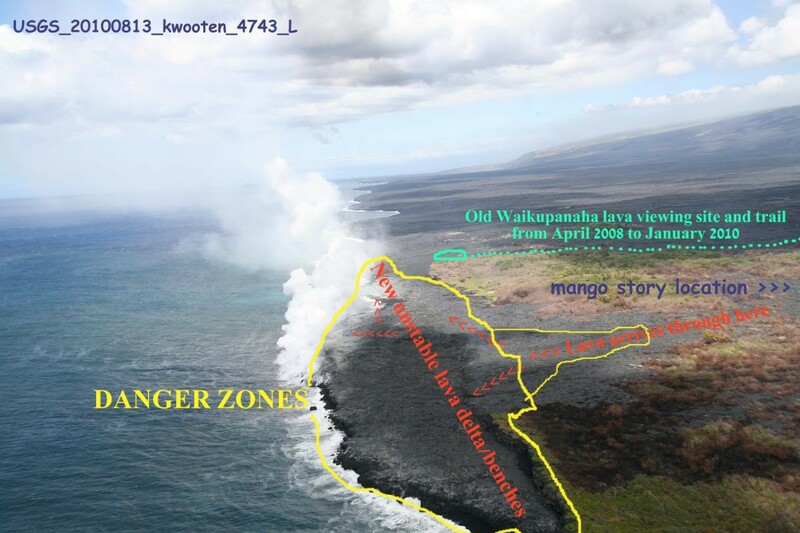 In the above photo, all the land just beyond the houses, and all the way to the right, (between the escarpment and houses) is where molten lava moved into from July 18th until August 2nd, at which time the lava ceased its forward expansion, stopping just short of several homes; though one home was destroyed on July 25th . The photos below were taken out on that hot & fuming lavascape. 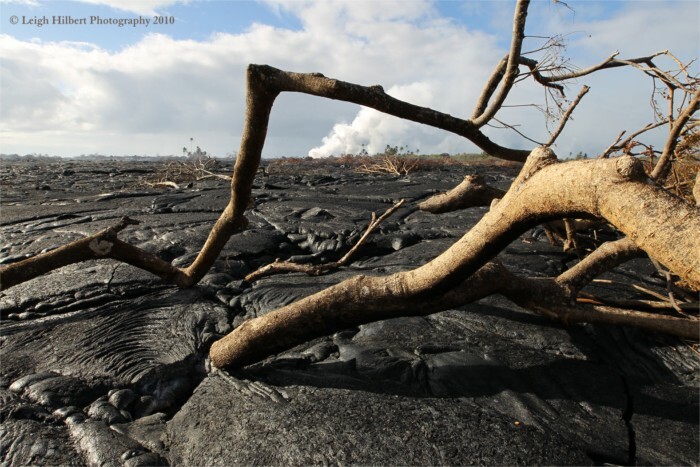 The mango forests are mostly all lava covered now but as these two photos show there are a few trees still smoldering on the coastal flats; the steam from the ocean entry plumes in the background. It was on this lavascape, when the lava was first moving through there, where I found the mango tree for my ‘Lava heated mangos’ story. STAY AWAY from new lava benches!! Also: a sudden onshore wind shift inland near the new ocean entries will bring with it a thick super-toxic mix of super-hot steam, rock-glass fragments, hydrochloric acid and other noxious gases…. A proper respirator is absolutely essential anywhere near the ocean entry zones! 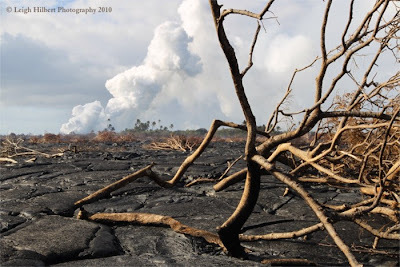 The other day I saw a random ‘tour’ group walking all along the billowing lava delta zones where they are essentially trapped between thick forest and the unstable, fuming, active lava benches. When the wind shifted on them they disappeared in a fog of toxins—that is bad and can kill you or destroy lung tissue, and burn eyes, among many other detrimental things… That area is NOT a place to be hiking close to or taking random tourists into period! Visitors to the county lava viewing access road during the day were able to see a line of degassing lava tube fumes trailing down the Pulama pali and out across the coastal flats, as well as the large stream plumes generated where molten lava continues pouring into the ocean a mile south of the road. By night a few small distant red-orange lava breakouts have been seen and the ocean entry steam alights with nice lava colors. 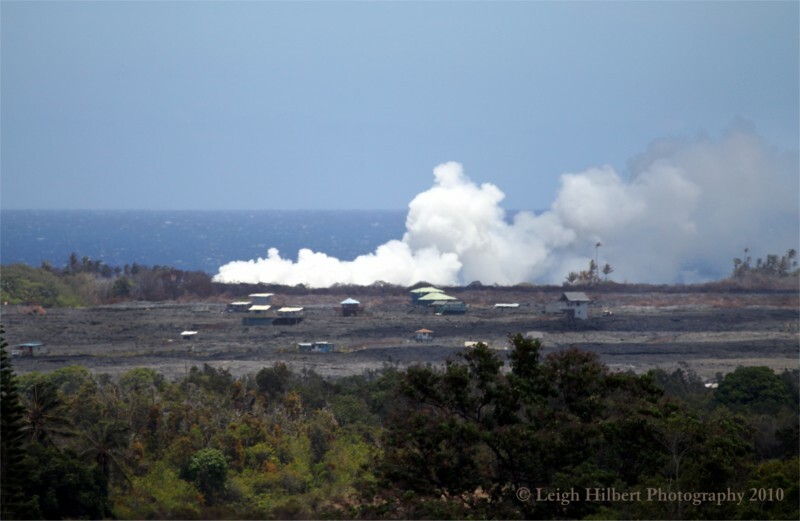 For more information about the Hawaii County Civil Defense lava viewing, phone 961-8093. If you listen to the recording you will be offered another phone number to call that will often be answered by security staff that are on location at the viewing site. The viewing area is open between 2:00 PM and 10:00 PM daily; last car allowed in to park is 8:00 PM.